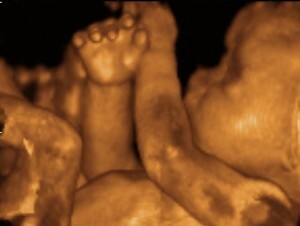 How Can We Achieve ‘Common Ground’ With Those Believe the Fetus is a ‘Parasite’? You are at:Home»Life Issues & Bioethics»Contraception & Abortion»How Can We Achieve ‘Common Ground’ With Those Believe the Fetus is a ‘Parasite’? Leftist activists speak a lot about the need to achieve “common ground” with their ideological foes. In the abortion debate abortion proponents will often say that they want to make abortion “safe, legal, and rare,” and will point out that even if we can’t all agree on the “legal” part, then we can at least agree on “rare.” Maybe we can’t agree on the ultimate legality of abortion, but at least we can work to “reduce the need” for it, they say. It all sounds good in theory: until the rubber hits the road, and pro-abortion activists launch an all-out war on the pregnancy resource centers that seek, you know, to actually help women who might want to keep their babies. Or until they oppose even the most basic, common-sense laws like parental notification laws, which protect young girls from being victimized by sexual predators. Or until they go to the mat to protect the unspeakably gruesome and medically unnecessary partial birth abortion procedure. Sometimes it can be frustrating to compare the rhetoric to the reality, and the question arises: why can’t we achieve any common ground with our foes, so we can at least reduce the number of babies that have to die, and the mothers who have to go through the trauma of abortion. Why can’t we work together in the most basic way to make abortion “rare”? And then there are those flashes of revelation that give a devastating insight into the possible reasons for this failure: first and foremost of which is the complete and total incompatibility of the pro-life and the pro-abortion worldviews. Case in point: a recent blog post on the Daily Kos blog titled “The fetus is a parasite.” Obviously the content is pretty self-explanatory, but here are some quotes just to give you the flavor. There you have it, folks. A fetus is a damn parasite and it invades the mother’s body like one too. I am the kind of woman who prefers science, studies, and medical facts over throwing pregnancy on the “magical miracle” band wagon. It is not magical, it’s called genetics and biology. God has nothing to do with it either. And it is not a damn miracle! If it happens every damn day, how is that even close to a miracle!? A miracle would be a man conceiving and gestating a fetus full term. It’s the sort of thing that leaves you blustering, grasping for words, and not finding them. Do people really think that way? Can it really be that someone can be so blind to the magnificence of the gift of life? Is it possible to be so insensible to the grandeur and mystery and awesomeness of pregnancy and childbirth? And how do you respond to such an “argument”? You can’t really, because the pro-life worldview assumes that life is, well, good: and if you can’t see that, then what argument is going to convince you? As pro-lifers we often naively assume that this is a self-evident principle universally adhered to. And if life is good, then the conception of a totally new human being must the most incredibly awesome, amazing, cool, unbelievable thing ever. It’s true of course that, as the Daily Kos writer says, an unborn child might be a “scary” and “terrifying” thing, but not because the mother has an evil blood-sucking creature latched onto her innards sapping away her vitality, but rather because of the mind-blowing immensity and awesomeness of the event in question: i.e. the existence of a new person with a totally new personality and all the uncertainties (and yes, risks) attendant upon that fact. And so the question is, can you really find common ground with someone who can’t see that? Who thinks an unborn child is literally a parasite, an enemy, an evil thing, an invader, akin to a tapeworm? I suppose: but don’t ask me where to find it. Excellent article! I’m sure these people wouldn’t recommend finding common ground with the nazis or slaveowners, and finding common ground with people who think it’s moral to kill the unborn is equally unrealistic.